Turnaround is 3 weeks - Order Early! ::We are proud to offer the absolute BEST in design and quality for baby and children's apparel and accessories! We are also making and shipping orders during this time, but emails are returned as quickly as possible. Emails sent outside of office hours will be returned as quickly as possible, but may wait until the next business day. During especially busy times, we may need more time to respond to messages. ::Please take note of our policies in the 'Shop Policies' section. There you can find shipping, refund and other important policy information. 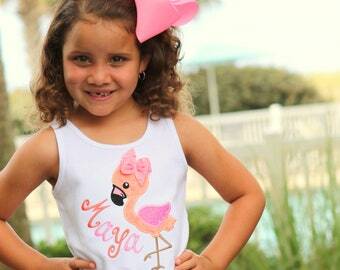 We hope you enjoy browsing the shop and finding sweet items for your Littles! Before you know it it'll be Back To School time! Order patriotic items by the 12th to receive before memorial day weekend! Our goal is to offer unique designs matched by outstanding quality, that will play a special part in your little one's first years. Melanie is the founder, owner and designer of Darling Little Bow Shop. She is the proud mama to four little girls who have provided the inspiration for Darling Little Bow Shop. Theresa provides general production support with hand sewing, tutus and ribbon prep. She is mommy to 3 kiddos, 2 boys and 1 sweet girl. Christine handles our sewn applique work, vinyl work and also handles any custom sewing requests. She is mama to 8, 5 boys and 3 sweet girls. Dottie provides general support for Melanie. Her tasks include sorting incoming orders, shipping, hand sewing, and purchasing. She is also Melanie's mom. Dottie is married to Greg, and has 5 children and is a proud Mimi to 11 grandbabies. Cheryl is highly skilled in machine applique and embroidery. She handles a large portion of our digitizing and embroidery production. She has 4 grown boys and is Meme to 5 grand babies. Thank you for shopping at Darling Little Bow Shop™, where you can always expect darling designs and outstanding quality. We do not accept returns or exchanges. Please contact us within 2 days of tracking showing delivery if you have any issues with your order. Cancellation requests are generally not honored as we begin processing orders immediately. Order changes are handled case by case, but generally we are not able to make changes from the original order. Orders ship in 3 weeks. Rush orders ship in 5 business days. All bows are packaged in sturdy boxes for shipping. Bows are made to order unless marked "Ready to Ship", and you can find current production times in each item description under the 'shipping' tab. All orders are shipped USPS first class or priority mail with tracking. **PLEASE make sure the address you leave at checkout is COMPLETE and CORRECT, as this is the address I will ship your order to. I cannot be held responsible for orders shipped to an incorrect address due to your error. ** Unfortunately, USPS does not 'guarantee' delivery time, except for Express service. While most orders take 2-4 days to arrive once shipped, there have been occasions when the shipping time is longer. 1. HOW DO YOUR SIZES RUN? Bodysuits are true to size. Girls and boys white shirts run true to size. Girls pink long sleeve shirts and boys brown and green long sleeve shirts run bigger. Tank tops run true to size (maybe a little long). Pants and shorts run true to size. We have size charts available so you can find your perfect size. 2. WHEN WILL MY ORDER SHIP? We are booked out 3 weeks as of 4/15/2019. 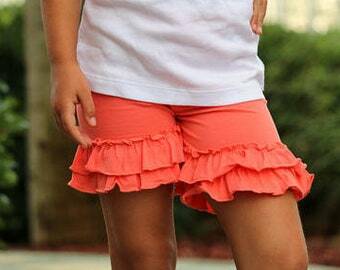 Ruffle leggings, capris and shorties ship in 1-2 business days. If you would like these shipped ahead of other items ordered, please be sure to order them in a separate transaction from shirts, bows, etc. 3. HOW SHOULD I WASH THIS? Shirts and dresses should be washed cold, gentle cycle, lay flat to dry or tumble dry low. Leg warmers are hand wash cold, lay flat to dry. Tutus are spot clean only. Pants and shorts wash cold, gentle cycle, lay flat to dry. 5. DO YOU ACCEPT CUSTOM ORDERS? Yes, but during busy season we may not be able to. Custom designs may be subject to a design fee. 6. DO YOU ACCEPT RETURNS? We do not accept returns, exchanges or cancellations. Please contact us within 2 days of receipt it you have an issue. 7. WHAT SIZE ARE THE LEG WARMERS? We have leg warmers in regular 12" and newborn 8" size. NOT ALL styles are available in newborn size. Unless noted as "newborn size", leg warmers are the regular, 12" size. 9. DO YOU OFFER COUPON CODES? When production load allows, we will post sale codes on our Facebook page. Typically we will run a surprise sale once or twice a year. Orders over $150 receive free shipping and no code is needed. 10. DO YOU OFFER RUSH ORDERS? Yes! We have an Expedited Service option to accomodate those who need items faster than our turnaround time. Please message us before ordering to be sure we can accomodate your request. You can view our Expedited Service policy at below. 11. HOW DO I NOTE MY CHILD'S NAME FOR THE ORDER? At checkout, there is an area marked "optional note to seller". You can note their name there. Rush service fees are non-refundable.